The venetian patrician Giovanni Pisani bought some confiscated properties (which once belonged to the Nogarole family, allied of the Imperial army during the Cambrai War) in Bagnolo, near Lonigo, during an auction sale in 1523. In addition to these properties, Pisani also obtained the title of count and feudal rights such as imposing angherie (that is, working without a salary). Settled in Bagnolo, these rich venetians began a prosperous agricultural activity, by bringing in specialised crops (such as rice and hemp) and by using the river Guà both as a source of hydraulic power and as a trading route. They built, in addition, wide warehouses, some buildings for the transformation of products and an impressive Doric colonnade (later destroyed) embracing on three sides a courtyard as wide as S. Marco Square in Venice. The Pisani family aimed at bringing to the mainland the entrepreneurial and mercantile mindset typical of the Venetians, who were gradually leaving the risky sea-trade in favour of the more profitable investments in agricultural lands. In order to mark their property with a building that could celebrate their prestige, Giovanni and his sons Marco, Daniele and Vittore hired Andrea Palladio around 1540. He designed for them a peculiar building with two façades. 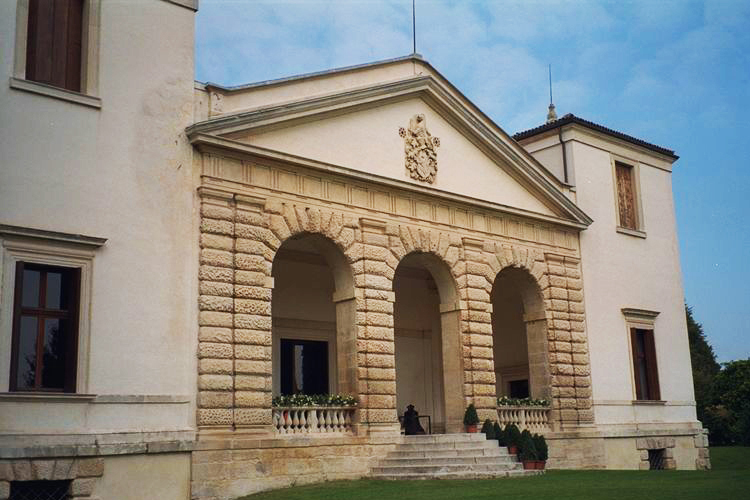 The facade overlooking the internal courtyard, which was described in the “Four Books of Architecture” by Palladio but was never built, was characterised by an elegant classic pronaos: it hinted at the beauty and usefulness of living in a villa by blending with the surrounding landscape. The façade overlooking the river is completely different – two small solid towers contain a loggia characterised by three arcades with rusticated ashlars, dominated by a tympanum. 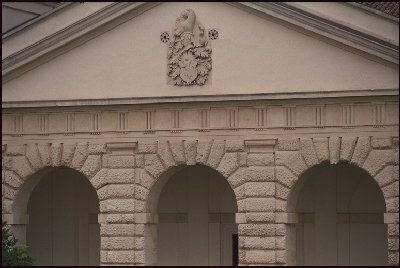 This façade recalls several things: on the one hand, it recalls the venetian motif of “casa fondaco” (a warehouse, confirmed also by the presence of a river) and it therefore refers to the commercial vocation of its owners; on the other hand, its resemblance to a majestic triumphal arch seems to meet the self-praising character of the Pisani family, feudal lords of that place. We should not forget that this venetian family also commissioned two other relevant buildings in the territory of Lonigo: the monumental Palace in the city centre and the famous Rocca Pisani designed by Vincenzo Scamozzi.